While Donald Trump took all 7 of Oklahoma’s Electoral College votes and the national election, the Libertarian Party of Oklahoma posted a major victory of their own. Gary Johnson, the Libertarian candidate for President, posted a vote return of 5.74% and a total of 83,334 votes in the Oklahoma election. This election return means that the Libertarian Party beat the needed 2.5% of the vote to stay recognized as a political party in Oklahoma. This means that they will not have to petition to be recognized for the 2018 election. Had the State Legislature not reduced the percentage of the vote necessary to retain party recognition, the Libertarian Party would have fallen far short of the previous 10%. We are glad to see that the lower threshold, although still not as low the 1% requirement prior to 1974, allows the Libertarian Party to focus the next two years on building their party. The only other party, aside from the Republican and Democratic parties, to meet the previous 10% vote test was the Reform Party in 1996 when Ross Perot won just over 10% of the vote. With this victory for the Libertarian Party, it is unlikely that the Legislature will have much incentive or will to further reduce party petitioning or retention requirements. However, there are plenty of other ballot access reform measures that we will be focusing on. Chief among these is reducing the petition requirement for Independent Presidential candidates and Presidential candidates of unrecognized parties as well as provide for a fee in lieu of a petition. Both Jill Stein and Rocky De La Fuente are suing Oklahoma over the high presidential petition requirement. We will continue to advocate for further changes to our election system. As of Sunday, Oklahoma voters will have the option to pick between three candidates for President and Vice President. The Libertarian Party held its national convention this past weekend and they elected Former New Mexico Governor Gary Johnson for President and Former Massachusetts Governor William Weld for Vice President. Both candidates took two ballots to elect, but both pulled a little over 49% of the vote on the first ballot. This is great news for voters in Oklahoma and especially the Libertarian Party of Oklahoma. They spent a lot of time and money to get on the ballot this year and are excited for this news. 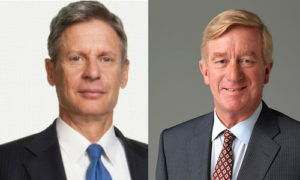 Congratulations to Governor Johnson and Governor Weld, the Libertarian Party’s candidates for President and Vice President of the United States! You weren’t handed this victory on a silver platter, it wasn’t scripted or “made for TV”, and it definitely wasn’t easy, heck it wasn’t even pretty. Because of this the world got to see a legitimate and principled political process take place, and this is just one of the reasons why the Libertarian Party is the ONLY legitimate party on the ballot in 2016! We are all looking forward to a presidential campaign that puts our party’s principles in the limelight and on the presidential debate stage. The momentum you will provide will cause the Libertarian message to be loud and clear in the main stream benefiting Libertarian races all over the country, and there’s no reason for us not to push it on into the White House from there! According to recent news, Gary Johnson is already polling well against Donald Trump and Hillary Clinton. In addition to that, the Co-Chair of the Commission on Presidential Debates has called for Gary Johnson’s inclusion in future polling. We will keep you up to date on any future news. Candidate filings are closed, all challenges and withdrawals of candidacy have been completed and as it stands, the Libertarian Party will have the only statewide primary. Two Libertarians filed to run for US Senate and both stuck it out through the withdrawal and challenge phase. Libertarians Dax Ewbank and Robert Murphy will be vying for the Libertarian nomination to run against Incumbent Republican James Lankford and Democratic candidate Mike Workman. Edit: Also running for US Senate are Independents Sean Braddy and Mark Beard. The Democratic Party almost had a statewide primary, but candidate Steve Perry withdrew his candidacy. This means that all Libertarian and Independent voters throughout the state will be able to cast a vote in a primary election on June 28. While there will be some Democratic Primaries around the state that independents will be allowed to vote in, they will be sparse and only cover portions of the state. All told, there are a total of 16 Libertarian candidates. One candidate Frank Robinson had his filing rejected due to non-payment of the fee and no petition. Robinson claims indigent status and will fight the refusal in court. Robinson would have filed to run for US Representative District 3. Another candidate, Paul Brewbaker had his filing challenged by Incumbent Republican Roger Ford of OK House District 95. Brewbaker, unable to pay the $250 bond to fight the challenge, lost. He will not appear on the November ballot. 15 of those 16 Libertarian Candidates will appear on the November ballot. Additionally, 20 Independents filed to run for office, more than has filed in over 10 years. For the first time in 16 years, Oklahoma voters will have a real choice in the November elections. 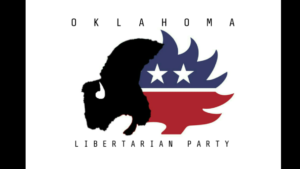 Today, the Oklahoma Election Board announced that the Libertarian Party met the petition requirement necessary for qualification. In a press release sent today, the Libertarian Party celebrated this news while also lamenting the limited window for registering as a member of the party while also announcing the date of its State Convention. The deadline for first time voters to register in the Libertarian Party is June 3, 2016. All registered Libertarians and Independents will be able to cast votes for Libertarians in the June 28th statewide primary election. However, if you want to run for office as a Libertarian, the Oklahoma Election Board will be accepting party affiliation changes for an additional five days after March 31. This is due to the overlap between the 15 days allotted by law to change parties if candidates wish to run under a newly qualified party and the April 1 cutoff date for party changes during primary season. According to the Election Board, around 72% of the signatures gathered were deemed valid. The Libertarians gathered 42,182 signatures. Of those, 30,517 were deemed valid. The minimum number needed to certify a new party was 24,745. Finally, the Libertarian Party wishes to thank all those who made this effort possible. The leadership of the OKLP would like to acknowledge all those who worked to bring another option to the voters of Oklahoma. A successful petition drive was just the beginning and now our focus will be reaching voters and candidates with the reality of looming deadlines. To learn more about the Libertarian Party of Oklahoma, you may visit the official website or their Facebook page. Here is a link to the official press announcement from the Election Board. The Green Party of Oklahoma also attempted a petition this year, but were unable to meet the required petition goal. This shows just how difficult Oklahoma’s reformed ballot access laws remain for grassroots parties. In addition to this news, this report highlights just how ridiculous Oklahoma’s ballot access retention test is. If a party manages to successfully petition to get on the ballot, a feat few parties are able to attain, in order to retain that access for a second election, the party would need to field a candidate for the top ticket, Governor or President, and earn 10% of the vote for that election. This past governor’s election, there was one Independent candidate that is a member of the Libertarian Party, Richard Prawdzienski. He gained 1.1% of the vote, far below what would be required had the Libertarian Party had ballot access in Oklahoma. However, in many states across the nation, 1% is all that is needed to retain ballot access. You can see by the LP’s blog post. They gained access in the following states that only require 1% of the vote Connecticut, Georgia, Kansas, Maryland, Michigan, Nevada and Wisconsin. Additionally, many states do not require a percentage of the vote on the top ticket. Several states have other requirements. For example, Idaho only requires a party to field 3 or more candidates in state or federal offices. Other states, such as Wisconsin, Michigan and Georgia, require a percentage of votes cast for other seats or combination of seats. Of the three states in which the the LP did not retain ballot access, all three have much easier retention rules than Oklahoma. Iowa requires only 2% of the vote cast for Governor, New York requires 50,000 votes, and Illinois requires 5% for Comptroller. All this illustrates that reforming Oklahoma’s petitioning requirement is not enough. We also need to reform Oklahoma’s party retention test. Prior to 1974, the test was only 1% of the vote cast for Governor or President. We need to return to that as well. It would also be good to change the vote test to only be required every four years rather than every election. If these rules could be changed, Oklahoma voters would have a far better election climate.